"As the day begins, the beach is empty, waiting to be filled." 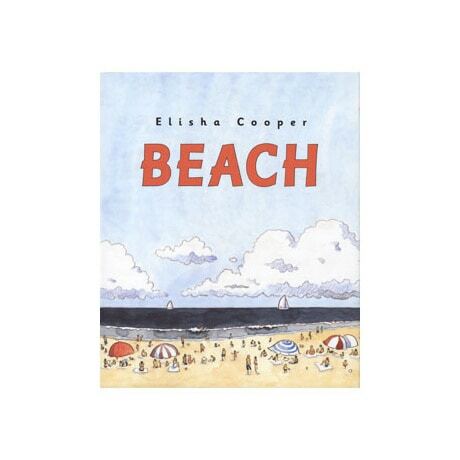 Depicting dawn to dusk at a beach with his simple yet expressive watercolor and pencil illustrations, Elisha Cooper—a Society of Illustrators 2006 Gold Medal winner for Farm—also shows readers and listeners up to 6 how a lifetime of happy memories are made. Along with tableaux of the serene beach and its shifting clouds, Cooper also pictures dozens of people having fun in their own individual ways, building sandcastles, watching porpoises, sunbathing, playing in the water, and having a picnic. Here too is the world just beyond the beach, with its lighthouse on a rocky point and a marsh inhabited by egrets.